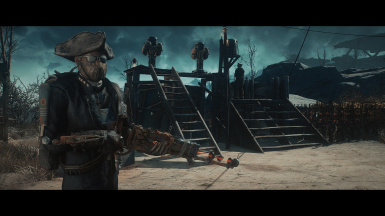 This mod enhances the Minutemen to convert them in a more strong background lore faction.  Adds a group of minutemen specialist that can spawns individually as others and gives all minutemen dedicated equipment to add a wild west and steampunk touch. My role in all this is that of the excited child who plays with his “Legos” and runs to the kitchen shouting: "Mom, mom, look what I have built!" 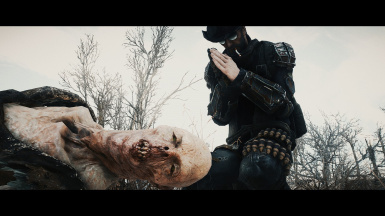 So yes, this mod would be completely impossible if there were not all the artists of modeling and texturing that populates this community and that makes Bethesda what it is, who evidently make games like Fallout or Skyrim touch the sky to lovers like me and year after year enjoy again and again the same drug, the same nectar while waiting for the next delivery grille. - Caliente, for his female body model.  - Valdacil, which has allowed AWKCR that many other modders can work.  - Gambit77, for his unsurpassed work at Armorsmith Extended. - Elianora, for his Eli's Compendium. Invaluable experience and talent with armor and accessories. - Fadingsignal, by West Teck Tactical Optics. 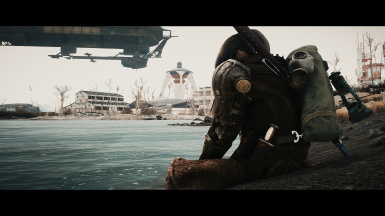 A mod of very high quality as well as with all his work. 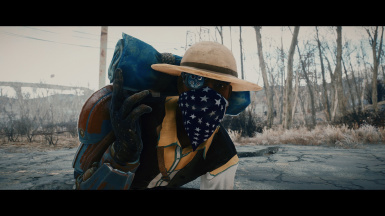 - Crimsomrider, for its accessories and clothing mods. 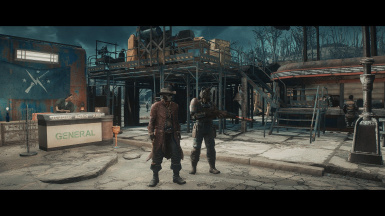 It makes the Commonwealth a much more enjoyable and lively place. - Arideya, by Wasteland Fashion. 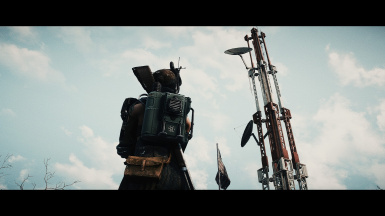 A mod that I have been using for years and I consider myself a number 1 fan for its style. 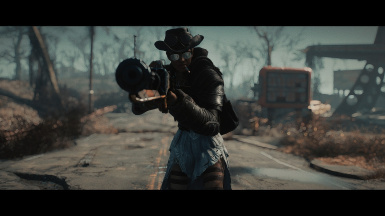 After my first game (without mods) I never got rid of it. - M150, for its incredible cigars, pipes and cigars that give a phenomenal touch to a game in which you do not stop to find tobacco and you can hardly see people smoking more than when they execute an animation. - Eferas, for his bandoliers, especially the brown one that is my favorite XD and my pj usually uses it. - Nman368, for its wonderful and configurable travel bag, that knapsack is amazing, especially with the hanging gas mask. 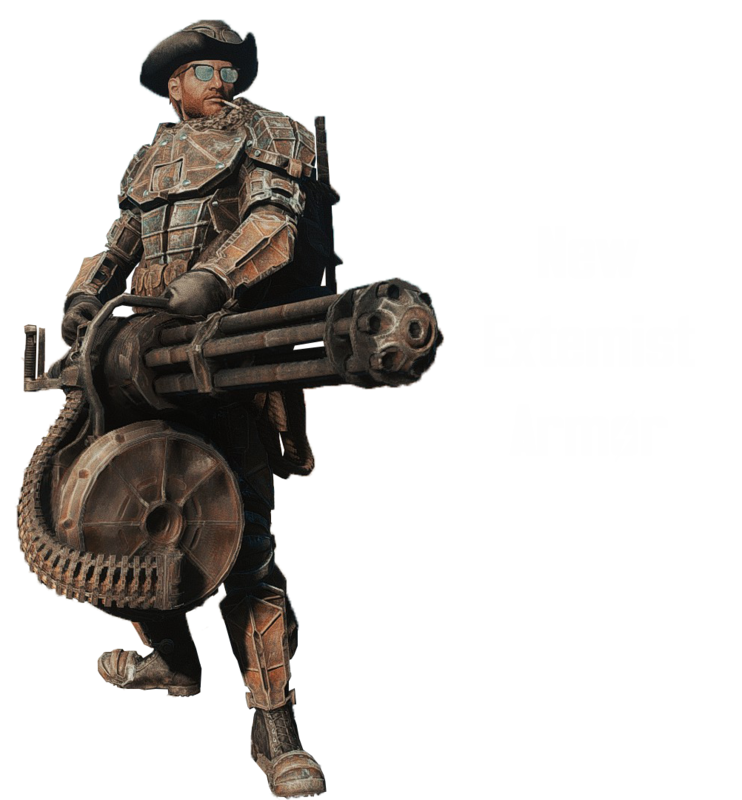 - New Tumbajamba armor for the extremists. - New Tumbajamba outfit for hunters.  - New equipment that the basic minutemen and specialists can carry in general. - Now scarves should be seen. - Fixed some internal errors of templates thanks to the collaboration of Thirdstorm. 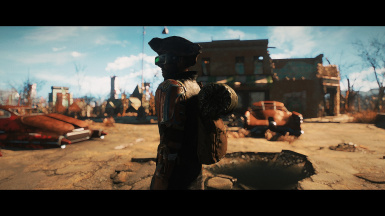 - I have published a patch to make the mod compatible with the Horizon's system, eliminating the carry capacity of the backpacks. 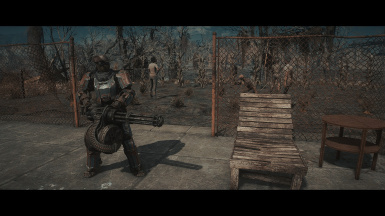 - Corrected armor that by mistake did not guarantee resistance to damage. - Fixed some equipment errors in relation to slots, stats, world models and values.  - New specialists: Minuteman conqueror, provisioner and marshal. 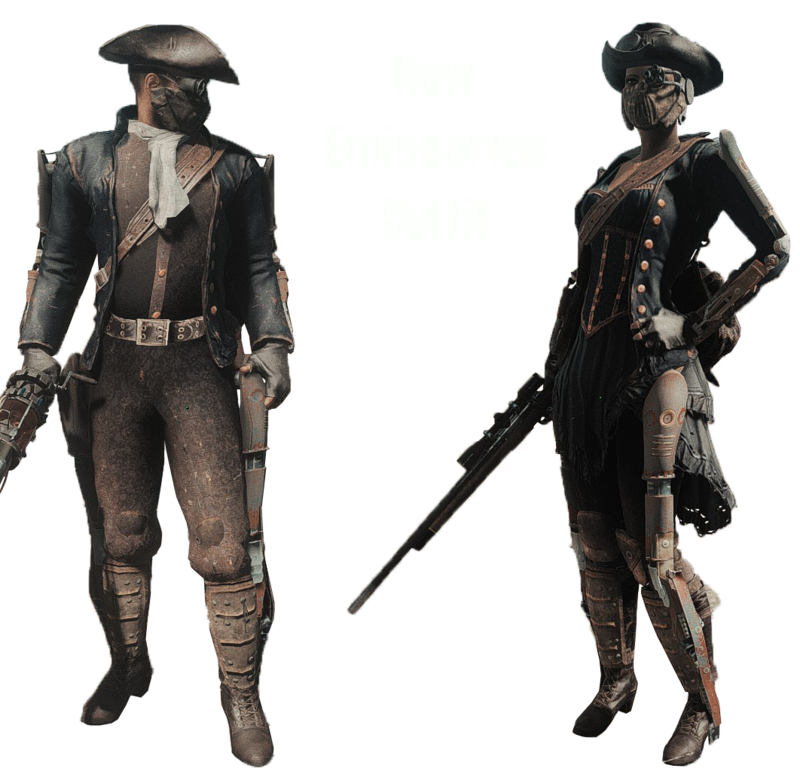 - New outfits for basic Minutemen, for pioneers thanks to Crimsomrider and emissaries thanks to Ja1ine. - New armors for conquerors and marshals by Tumbajamba. 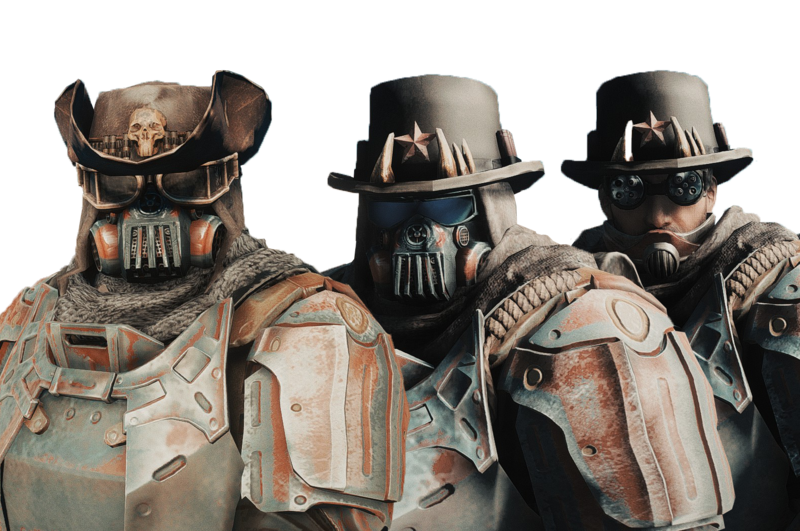 - New hats by courtesy of Tumbajamba for the extremist Minutemen.  the rebel backpack thanks to L0rd0fWar. 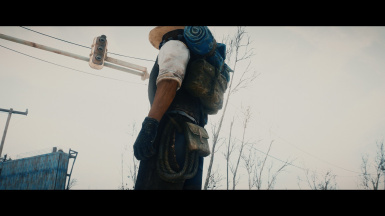 - New integrated equipment: Provisioner backpack and new gas masks thanks to m150. 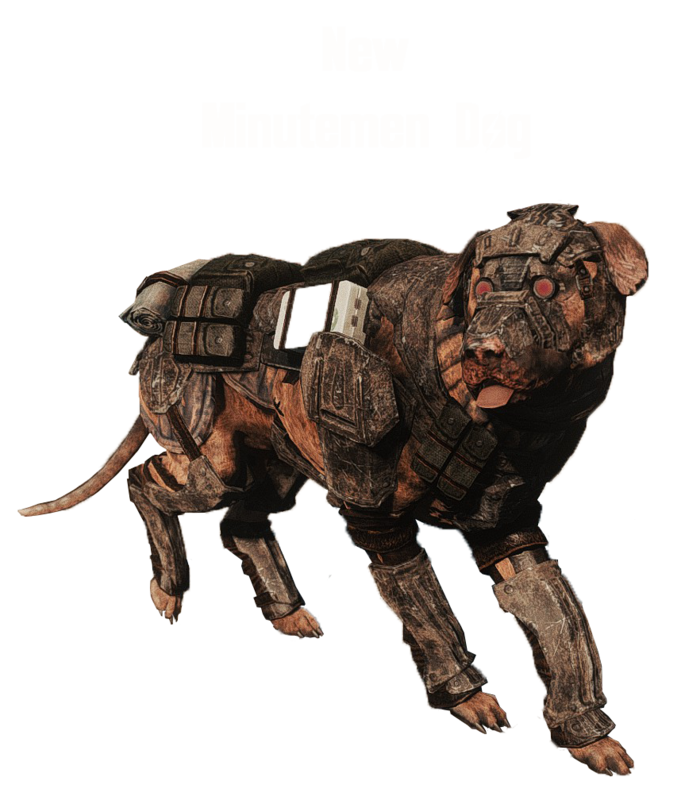 - New Tumbajamba armor for minutemen dogs. - New retexturized armors for hunters and strategists. 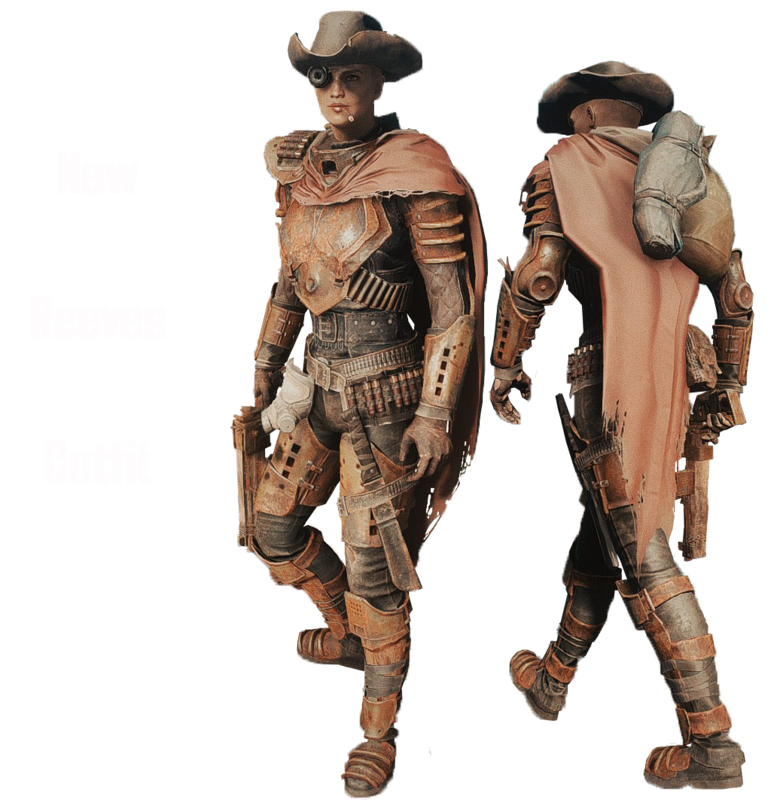 - New armor by Tumbajamba for reeves. 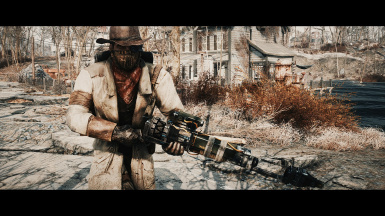 - Now we will consider Preston a specialist minuteman, strategist in fact, so now he wears a strategist duster. 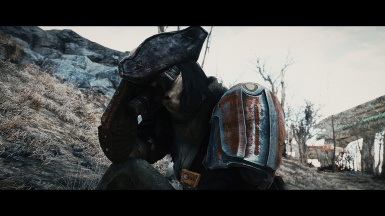 although she retired, a real minuteman never retires at all, so she keeps her old equipment.  - I have included several minutemen related to missions, such as the assault to the institute, to use my outfits and ranks. traditionalist so I had to replace it for now.  and I have not the permission to use it, the strategist will use the vanilla versión modified by me, reduced and renamed. - Now there are two separate version to let the user choose what body to use, CBBE or Vanilla. 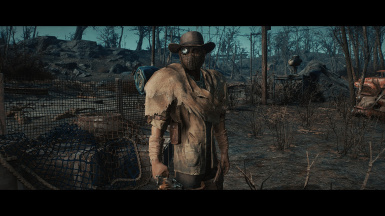 Preston now has a custom outfit according to the rest of the basic Minutemen, still using a duster, can be the colonial or the western outfit, now has eyewear, a variety of hats by chance and baggage.  - I have worked to bring a new reduced version with some mods integrated, so the master list has been reduced a lot. I have integrated the components from Eferas Shoulder Bags, Wasteland Fashion and Eli´s Compemdium so they are no longer necessary.  - I have tweaked the Minutemen Corpes you find around the Commonwealth to only get clothes and maybe a hat, this avoid the cheating sense. First of fall, sorry for my english, I'm not a native speaker. Please, be understanding and thanks for take your time to read. I have created a changes section to avoid the main page flooding.  I want to fix something, I forgot to credit MunkySpunk for his great textures of the dog armor, who gave me his permission but, dumb of me, I forgot to credit his great work, so there is a special mention in the head, because he is a great texturization modder. Do not forget to endorse his work and enjoy all his content. 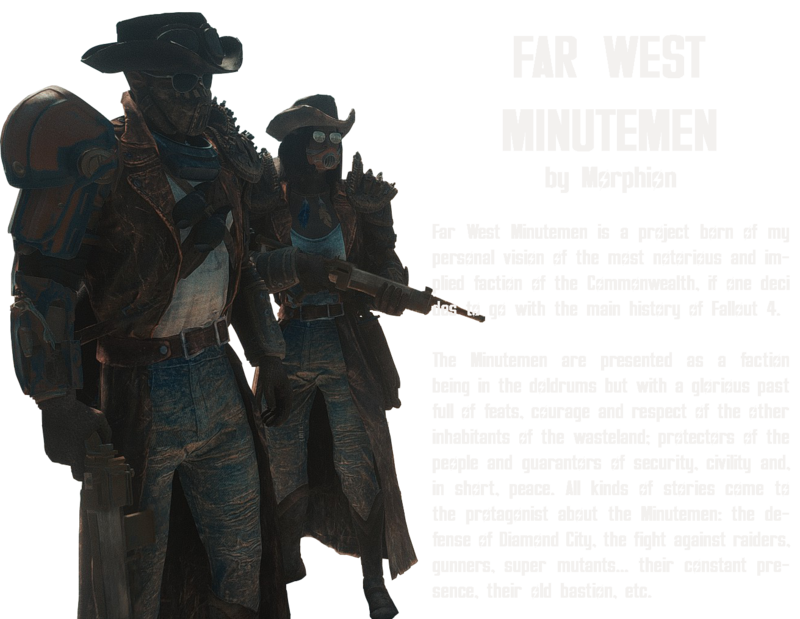 Far West Minutemen new Lite Version!  For those players that do not decide yet to try the mod :) or those who do not want the full version of what I dreamed. 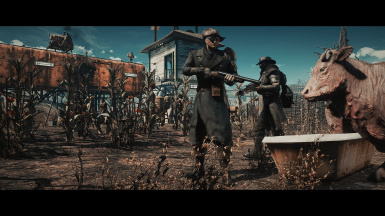 I bring news hehe, I think this is going to like a lot of users :) I have been working on a new version of the mod, more lite, more balanced with a survival game focused on the scarcity, so now I release Far West Minutemen - Lite Version!  This is a version with only one prerrequisite among the DLCs, you only need AWKCR, this version does not need Armorsmith Extended either Cross Cybernetics, Crimsomrider Accesories or West Tek Tactical Optics, it is a version focused on those players who want enhance the minutemen faction with a no steampunk style but still Far West, but without a lot of dependencies or overpowered gear.  This version includes all Tumbajamba's works so the Minutemen wear their outfits, hats and other equipment as always, but this time there are chances to not wear them, just outfit and hat. - New Tumba outfit for hunters.  - New equipment by Tumba that the basic minutemen and specialists can carry in general.  - Newspecialists: Minuteman conqueror, provisioner and marshal. 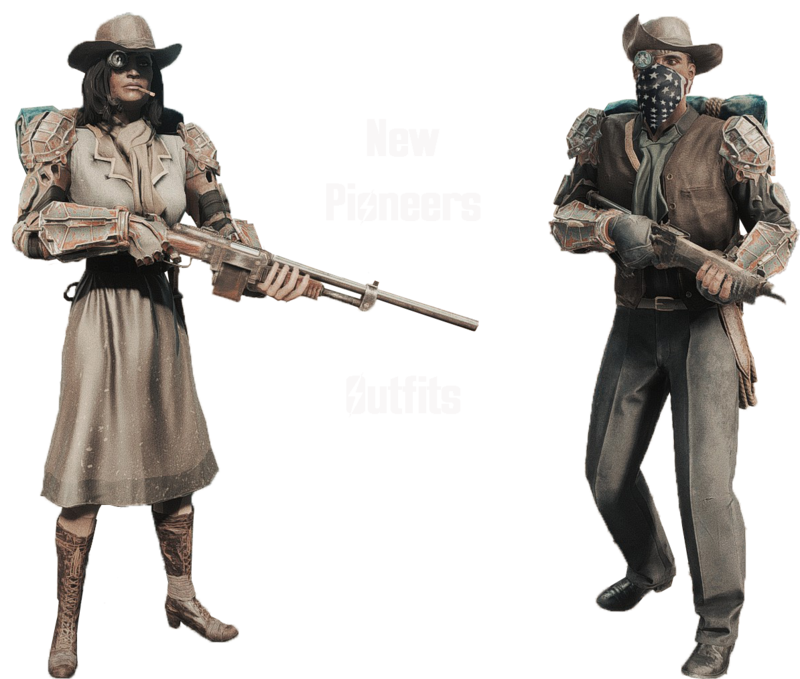 - New outfits for basic Minutemen, for pioneers thanks to Crimsomrider, emissaries thanks to Ja1ine.  - New armors for conquerors, marshals and reeves by Tumbajamba. - Warning!  : the new armors of tumbajamba are not unisex, they are designed for a specific male or female body, and some of them are not designed for the main player so can cause glitches in first person view, specially crouched. 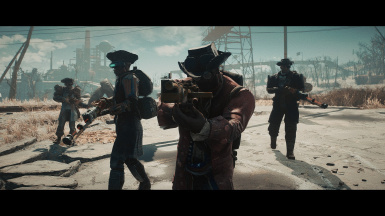 The mod is designed as a visual overhaul of the minutemen and the armors fit well on npcs and maybe not on the player as I have said. 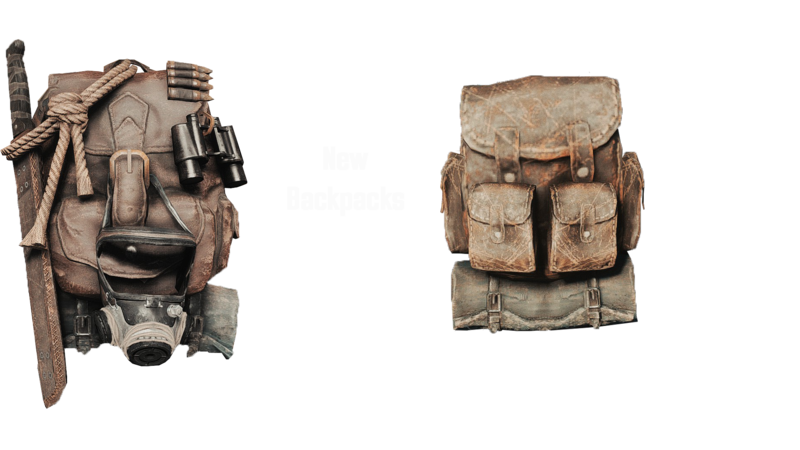 - Two new backpacks courtesy of Tumbajamba and the integration of the rebel backpack thanks to L0rd0fWar. 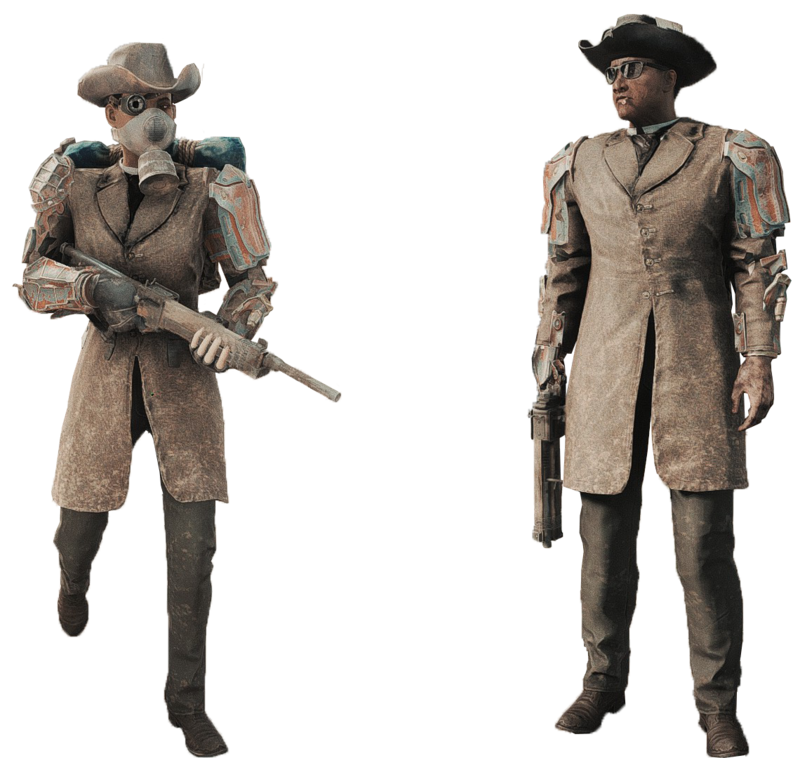 - NewTumbajamba armor for minutemen dogs. 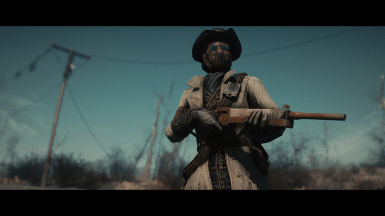 - New visual aspect for Ronnie Shaw, now considered a recognized ex-reeve, mediator of conflicts with a firm hand, and although she retired, a real minuteman never retires at all, so she keeps her old equipment. 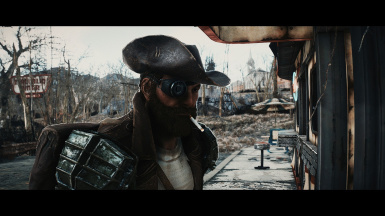 Due to the inability to contact with the user m150 and toshizo7 I have not made possible to include the mod Cigarettes in Mouth (you can see lot of images here of Minutemen smoking cigars and pipes) that was a fundamental part of my mod and the asset scarfs from Eli's Compendium, there may be some images with them). 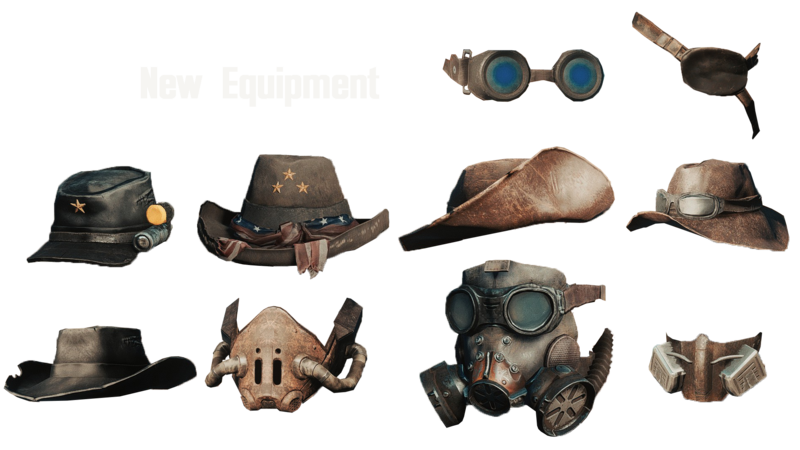 These items are already included in other version so, if in the future they give me their permission I’ll update the mod to include these assets, but for now it can´t be possible. 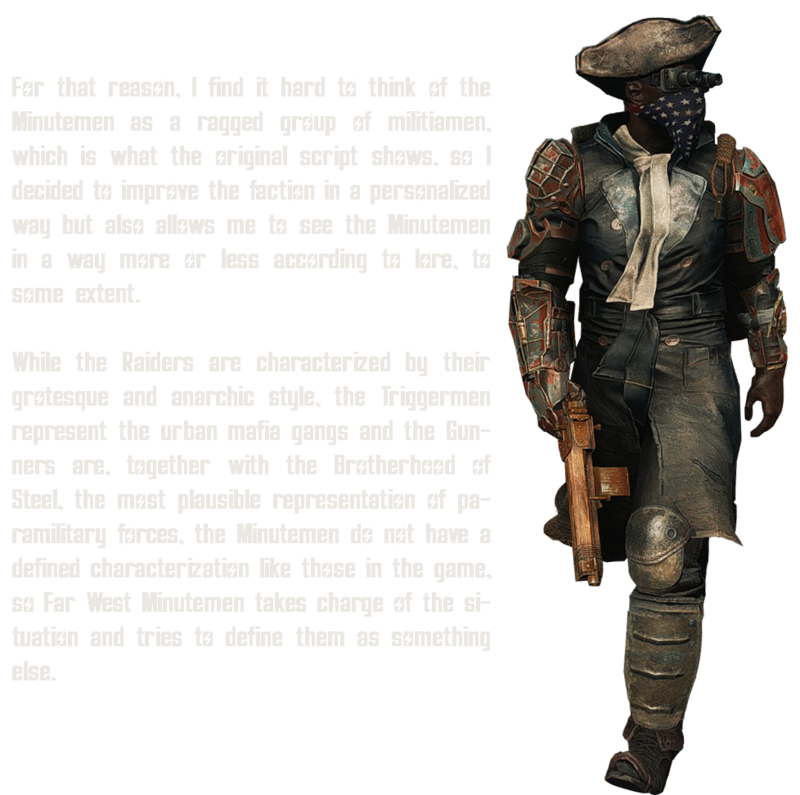 First, enhances the faction with a variety of professional troops with custom names that adds flavor to the Minutemen in a simple way, they still being basic minutemen, but they have a background and their outfits and equipment show it.  Second, make elaborated and custom leveled list of outfits and equipment assigned to the common minutemen list and the specific specialists lists. 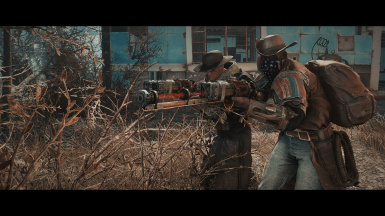 Far West Minutemen does not modify any weapon that the Minutemen use. 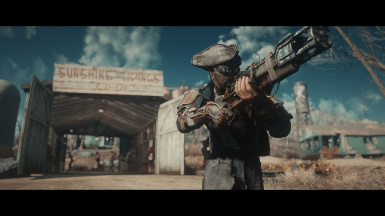 I would like to make my custom list at this point, but due to the scripts injection that most weapon mods nowadays do it’s a little complicated.  Clarifying a bit about specialist spawns, FWM modifies the LCharMinutemen List to integrate, among the basic minutemen that still being there (and their proportion have been increased) the rest of minutemen that I have created.  These Minutemen level scale with the player according to the vanilla values. 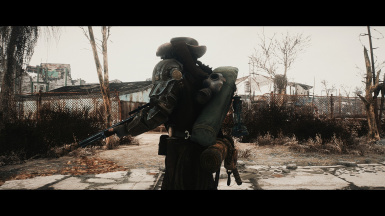 Thanks to the suggestion of Aldebaran90 when I asked her for permission to use his mod, I integrated the 3 backpacks of Wearable Backpacks and Pouches (Venturer, Wanderer and Traveler) so that the mod is not necessary. In contrast, if you are a user of this mod you are likely to find the recipe for repeated manufacturing in the armor workbench. 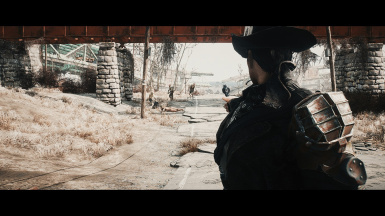 To avoid repetition I will include a download of the mod without the recipes. Thanks too to Eferas for give me permission to integrate the shoulder bags. Caliente, for his female body model. Valdacil, which has allowed AWKCR that many other modders can work. Gambit77, for his unsurpassed work at Armorsmith Extended. Niero, for Pre-war Cybernetics, the base of my inspiration. Elianora, for his Eli's Compendium. Invaluable experience and talent with armor and accessories. Fadingsignal, for West Teck Tactical Optics. 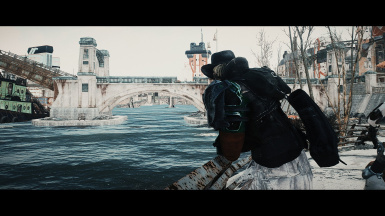 A mod of very high quality as well as with all his work.  Crimsomrider, for its accessories and clothing mods. 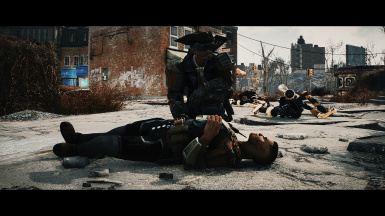 It makes the Commonwealth a much more enjoyable and lively place. M150, for his incredible pipes and cigars that give a phenomenal touch to a game in which you do not stop to find tobacco and you can hardly see people smoking more than when they execute an animation. Aldebaran90, for the backpacks and pouches, her mod is essential for me. Ellise, for her black shoulder bag in the Compendium, looks great! 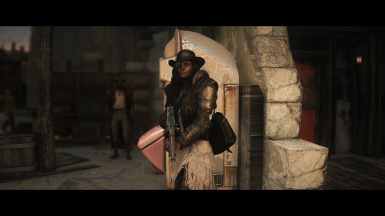 Arideya, for Wasteland Fashion. 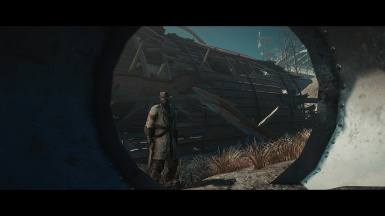 A mod that I have been using for years and I consider myself a number 1 fan for its style. 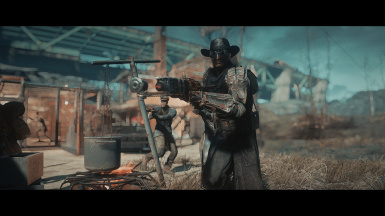 After my first game (without mods) I never got rid of it. Eferas, for his bandoliers, especially the brown one that is my favorite and my pj usually uses it. Nman368, for its wonderful and configurable travel bag, that knapsack is amazing, especially with the hanging gas mask.